TICKETS ARE SOLD OUT! Visit NationalEclipse.com/events for more opportunities. On August 21, 2017, Oregon will be the first to see the total eclipse of the Sun. Join OMSI at the Oregon State Fairgrounds where we will celebrate the unique experience of complete darkness for close to two minutes. The Solar Eclipse Viewing Party will include science lectures, astronomy-related community groups, entertainment, and more. Tickets are sold out and the waiting list is full! - Viewing Party is rain or shine; all tickets are non-refundable. OMSI relies on the weather forecast from the National Weather Service. - Tickets include a pair of solar eclipse viewing glasses and a ticket to the Oregon State Fair, Aug 25-Sept 4. These will be distributed at the event entrance upon arrival and cannot be picked up prior to the event. Your ticket guarantees you a seat in the amphitheater. You MUST use a solar eclipse viewer to watch this extraordinary event. -See below for more information, including FAQs, directions, and schedule of events. The Solar Eclipse Viewing Party will be located at the L.B. Day Amphitheatre at the Oregon State Fairgrounds, 2330 17th St. NE, Salem, Oregon 97301. See driving directions and fairgrounds map. Parking will open at 3am and will be $5 per vehicle. All ticketholders are guaranteed a parking spot; please be prepared to show your event ticket to the parking lot attendant upon arrival. You can also pre-purchase your parking via the Parking Panda website, access code: Eclipse632. Travel time: The current estimated time to travel from Portland to Salem on Monday morning is 6 hours. It may also take 1-2 hours to travel from the freeway exit to the fairgrounds. Please plan accordingly. (Oregon is expected to see over 1 million visitors for the solar eclipse.) To check current traffic conditions go to TripCheck.com. Food and drink will be available starting at 6am. No outside food or drink allowed; refillable water bottles will be permitted. Food options include Pronto Pup, Yakisoba, JR’s Taqueria, a breakfast buffet, coffee and more. Vegetarian, vegan, and gluten-free options will be available. Visit the Travel Salem website for hotel recommendations. The L.B. Day Amphitheatre has open-air, stadium seating for the viewing. Please plan accordingly. Seat cushions will be allowed. Souvenir eclipse merchandise including t-shirts, mugs, keychains, etc. will be available for purchase at the event. No pets are allowed at the event. Service dogs are welcome. Due to the number of guests attending the event, we are not allowing personal telescopes or 3-legged tripods into the event. If you have a single pole, monopod those are allowed. Solar telescope viewing will be available at the event in the Rose City Astronomers booth. No large bags, backpacks will be permitted. All bags will be subject to check. Weapons and fireworks are prohibited. The Solar Eclipse Viewing Party will include science lectures, astronomy-related community groups, entertainment, and more. Eclipse begins. Portland Taiko will introduce key eclipse moments with drum performances. Q: How many people do you expect to attend this year’s event? A: We are estimating 8,500 guests. Q: I lost a copy of my print-at-home ticket. How do I get another copy? A: Email events@omsi.edu with the subject line “New PAH Eclipse Ticket” and we will send you a new one. Q: How long will the event last? A: The event is 6am to noon on Monday, August 21, 2017. Totality is at 10:18am. Q: Are there any other activities planned in addition to viewing the eclipse? A: There will be presentations by space science experts, educational demonstrations and activities, and local astronomy organizations. Q: Do I need to purchase solar eclipse viewing glasses? A: No, they are included with your ticket. Q: When do I need to wear solar eclipse viewers? A: If you are inside the path of totality, remove your solar filter only when the Moon completely covers the Sun’s bright face and it suddenly gets quite dark. Experience totality, then, as soon as the bright Sun begins to reappear, replace your solar viewer to look at the remaining partial phases. Outside the path of totality, you must always use a safe solar filter to view the Sun directly. The only safe way to look directly at the uneclipsed or partially eclipsed Sun is through special-purpose solar filters, such as “eclipse glasses” or handheld solar viewers. Homemade filters or ordinary sunglasses, even very dark ones, are not safe for looking at the Sun (special-purpose solar filters are many thousands of times darker than ordinary sunglasses). See the AAS Reputable Vendors of Solar Filters & Viewers page for a list of manufacturers and authorized dealers of eclipse glasses and handheld solar viewers verified to meet the ISO 12312-2 international standard for such products. The OMSI Science Store sells safe solar viewing glasses for $4.99 each. The OMSI Science Store is currently SOLD OUT of solar viewing glasses and will not be receiving any more before August 21. A: Yes. Parking will open at 3am and will be $5 for all vehicles. All ticketholders are guaranteed a parking spot; please be prepared to show your event ticket upon arrival to the parking lot. If you would like to pre-purchase your parking, you will be able to do so through the Parking Panda website, access code: Eclipse632. We are opening parking early to allow for guests to depart home early, but please be mindful of your behavior and respectful of the fairgrounds’ neighbors. Toilets will be available. There is no smoking, tailgating, or amplified music allowed in the parking lot. There will be no loitering in the parking lot during the event. A: Yes. It will be $5 cash and we have a special lot reserved for handicap access. Q: Can I sit by my car and watch the eclipse? A: No, there is no loitering in the parking lot. Q: Can I bring in my own picnic lunch? A: No outside food or drink will be allowed into the event. The Oregon State Fairgrounds will be providing food carts and a bar. Current food options include Pronto Pup, Yakisoba, JR’s Taqueria and more. If you have any dietary restrictions, you can email events@omsi.edu with questions/concerns. Q: Is the amphitheater wheelchair accessible? A: Yes, there will be a wheelchair-accessible area available. Q: Can I bring my own personal telescope into the event? A: Due to the number of guests attending the event, we are not allowing personal telescopes to be brought into the event. Q: Can I bring my camera tripod? A: Due to the number of guests attending the event, we are not allowing 3 legged tripods into the event. If you have a single pole, monopod those are allowed. Q: Can I bring my own chair or blanket to watch the eclipse? A: No. We don’t have access to the entire fairgrounds for this event. However, you are allowed to bring in seat cushions for the amphitheater. Q: Will there be wheelchairs or strollers available for rent? A: No. Please bring your own. Q: Does my ticket include a guaranteed seat in the amphitheater? Q: How long will it take to get from Portland to Salem the day of the event? Q: How do I get to the Oregon State Fair and Exposition Center? A: Take I-5 south to exit 258 and following the signs to the fairgrounds. There will be additional signage telling you where to park. Q: Where can I stay overnight in Salem? A: All hotels and state campsites in Salem are completely full. RV camping is still available at the Fairgrounds. Travel Salem is the best resource for lodging. Q: I am taking the train to Salem that day. How far is the train station from the fairgrounds? A: There are two trains coming from Portland on August 21. Train 1013 arrives at 6:10am and Train 503 arrives at 7:00am. Both will stop near the fairgrounds at Woodrow St. Railroad Crossing (5 blocks from the event entrance). Train 1012 will depart the Woodrow Street Railroad Crossing at 1:00pm and all passengers should be there by 12:40pm. ONLY these three trains will be stopping at the fairgrounds. All other trains will be picking up and dropping passengers at the Salem Station only. Please check your train tickets to confirm times and locations, and call Amtrak at 1-800-USA-RAIL (1-800-872-7245) with any questions. Q: Are weapons permitted in the event? A: No. "Weapon" includes, but is not limited to, any firearm: any destructive device; any dirk or dagger; any knife with a blade three inches or more in length, and any snap-blade or spring-blade knife, regardless the length of the blade; any ice pick or similar sharp stabbing tool; any straight-edge razor blade fitted to a handle; any device by whatever name known, which is designed to expel a projectile by the action of compressed air, gas, compressed spring or by any chemical action; any dangerous or deadly weapon within the meaning of any Oregon law restricting the use there in; any cutting, stabbing or bludgeoning weapon or any other device of inflicting grievous bodily harm. Weapons of OSFEC law enforcement officials and those carried by persons authorized by law to carry them when carried in a manner authorized by law will be permitted. Q: Are fireworks permitted into the event? A: No. Fireworks, explosives or explosive devices, and inflammables are prohibited. Looking for more space science? Explore Eclipse 2017 and beyond with OMSI. 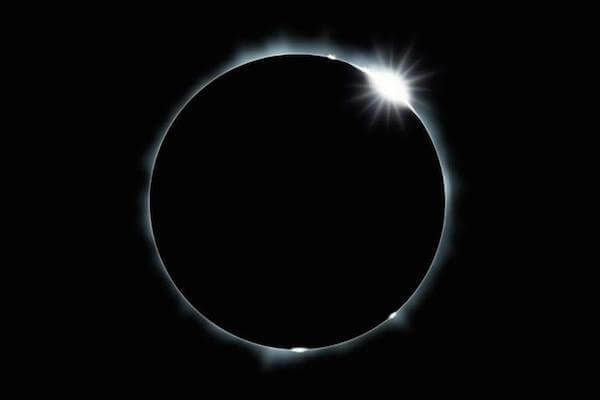 A total solar eclipse is when the moon moves right in front of the sun, covering it completely for a very short time. It darkens the whole sky, lets you look right at the sun*, and shows you the beautiful corona that surrounds the sun. Stars come out, the horizon glows with a 360-degree sunset, the temperature drops, and day turns into night. Oregon is on the center line and several cities around the state will experience maximum totality. See detailed map of the eclipse path in Oregon. On the beach in Oregon, just north of Newport, the shadow will first touch land at about 10:15am, and will experience a full minute and fifty seconds of totality. The actual centerline of the eclipse path will hit solid ground six seconds later, and plunge Lincoln Beach and Depoe Bay into darkness for one minute and 58 seconds! It will take only two minutes for the shadow to race eastward toward its first date with a large population of folks who will be breathlessly awaiting its arrival. Salem, Dallas, Albany, Corvallis, Lebanon, Philomath, McMinnville, and Woodburn, will experience various lengths of totality based on their varying distances from the centerline. At the Oregon State Fairgrounds, we will be treated to one minute and 53 seconds of shadow at just after 10:17am. The eclipse will travel through the forests of central Oregon, hitting the mountains at Madras and Warm Springs at about 10:19am. Mitchell and Prairie City will be next, and the shadow will leave Oregon just north of Ontario. The majority of the Pacific Northwest, including Portland and Eugene, are NOT in the path of totality, will witness a partial eclipse ranging from 88% to 99%. *Note: Only look at the sun when it is 100% covered. You must use special solar viewing glasses whenever the sun isn’t completely eclipsed or it may cause irreparable eye damage. Viewing Party tickets include solar viewing glasses. Solar eclipse glasses are currently available for purchase in the OMSI Science Store for guests unable to attend the viewing party. Watch our video on 5 ways to safely view the eclipse. NASA’s Scientific Visualization Studio Eclipse Gallery: Scientifically accurate visualizations of solar eclipses including position of the Earth, Moon, and Sun, and path of the Moon’s shadow from different perspectives. Shadow and Substance: A simulation for Oregon showing where totality and partial phases can be viewed. NASA Eclipse Simulation: Students discover relative relationships between the Sun, Earth, and Moon, and how the Moon can eclipse the Sun. Bob Miller’s Light Walk: Bob Miller, a former exhibit builder at The Exploratorium, explores the dynamics of light and how our eyes can see the world through a pinhole of a pupil and how we can take advantage of this to make a pinhole camera that will let us see the world, in particular sun and solar eclipses. Watch a video of one of his famous Light Walks. NASA Wavelength: A full spectrum of NASA resources for Earth and space science education. Eclipse in a Different Light: A Sun-Earth Day page for educators presented by NASA. Sign up today and receive weekly updates on all things OMSI, including upcoming events and deals.